We know very little about iOS 6, the next version of the iPhone and iPad operating system that is likely to be unveiled at Apple's World Wide Developers Conference tomorrow. So this is a list both of what we know, and what we want. According to rumors, Apple is supposed to add a new generation of Maps into iOS 6, replacing Google map services with its own. Apparently Apple's version will be fully 3D and beautiful. But that's not what I really want for maps. What I want for maps is offline caching, so I can look at them when I'm not connected to the internet—a feature Google announced just this week. And I want to be able to synchronize my maps' bookmarks, and send routes from my desktop computer or my iPad to my iPhone. Oh, and turn-by-turn directions. Make it a good GPS already. Fancy visualization would be great—especially if you get rid of the dreadful tiling and make everything vector-based and fast—but the other features are more useful. And more importantly, they're starting to be available elsewhere. 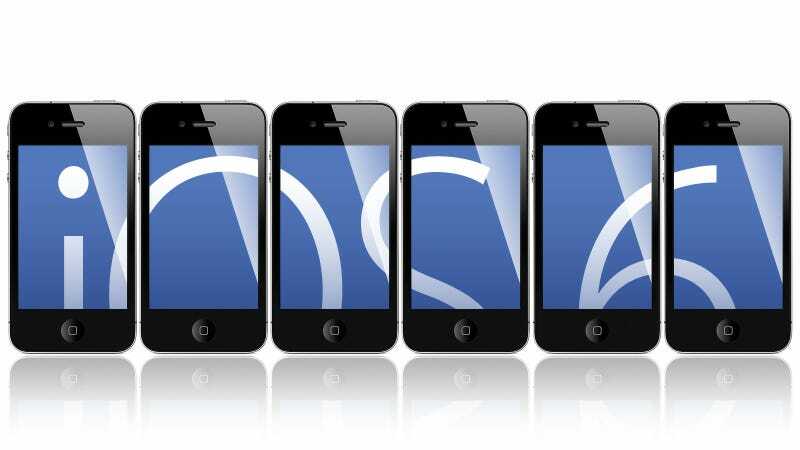 The (surprising) rumor is that Facebook will be tightly integrated with iOS 6, much like Twitter was integrated in iOS 5. If this means that we can merge our address books and event calendars, then that's good news. Same with photos: it would be nice to snap photos and upload them straight into Facebook albums much like you do now with your iCloud's Photo Stream. You could even, conceivably, integrate Facebook Chat straight into iMessages. However, I doubt both companies would be interested in such a thorough commingling. Most probably, the Facebook integration means some kind of status, link and image-sharing option—a la Twitter—and system-wide Facebook authentication services for other apps. At this point I would be just happy if iMessages worked as it should. Because right now it's broken, with crappy synchronization across devices. This must be fixed, because cross-device synchronization is the entire point. iMessages' notifications must be fixed too: I don't want 189 message notifications piling up when I turn my iPad on after having just had conversations in my iMac or iPhone. Just tell me you have added 189 new messages instead of bombarding me with the same conversation I had three hours ago. That would be just fine, thank you. But I want more than just basic functionality. I want iMessages to connect to Gchat, AIM, and Facebook. And I want this to be seamless. Just pick a user for my address book and starting chatting, regardless of what platform they're on. The iPhone and iPad need to synchronize more with other major services. I want the built-in Safari to synchronize with my Chrome's bookmarks in the same way the iOS Calendar synchronizes with Google's Calendar. There's no reason to make users' lives more difficult by limiting other computing platform options (other than to lock people into Cupertino's world). But if Apple loosens up and plays nice with other popular providers, its devices will only be more attractive. I'm tired of having to get into Settings to regulate the brightness of my iPhone, turn on Wi-Fi, or change 3G to Edge when I'm travelling to save energy. These are settings that should be readily available at the touch of a button. Apple can add them easily and conveniently, perhaps in a redesigned notifications panel. Notifications were a good—albeit belated—addition to iOS. But they are not as good as they should be. I want to be able to dimiss them right away, so they don't interference with what I'm doing. I don't know how many times I've been about to hit a Send button on the top of the screen but I had to wait until a notification disappeared (Update: you can dismiss them by swiping to the left, but how many people know this? Just a low percentage of advantage users, I'm sure. The rest is stuck at oh-f*ck-this-notification-get-out-already!). We need to be able to dismiss notifications right away, and also group them in some way when they start to pile up. Also, please add an option to permanently turn off notifications when I'm playing games. Or make them one of the quick-access settings, so I can turn them on and off quickly whenever I want. I know that Apple fanboys think that the current iOS interface is the bee's knees. It's quite good, but in reality, it's just a glorified Palm or Newton MessagePad. For example, it lacks the immediate access to information provided by a user interface element like live tiles. It could take cue from the current poster boy of user interface design: Microsoft's Metro. 1. Display information on icons: I want app icons to be more than just static symbols with a numbered red badge. They don't have to be as big and flashy as tiles, but I think they can certainly be improved. Perhaps they can be animated by the app to indicate status changes or pertinent information. An ESPN app that displays constantly updates scores, for instance. A native weather app that shows the current temperature. Or think about Apple's old idea from the days of Copland (the operating system that never was): show a folders' status by changing the icon itself. Example: a folder that hasn't been used in a long time would look dusty and old. Or a folder would appear to be bulging whenever the number of folders inside would pass certain thresholds. Think about doing the same with app icons. There's a lot of room for improvement with this very simple interface device. 2. Folder organization: Speaking of folders, there's ample room for improvement of the current folder structure. A box with tiny icons that nobody can see is not a very effective way to store apps. It's just as bad as having 24 springboards. I want iOS to have an automatic app organizer. One that would let you have any app you want to use right away on the main springboard, and then have all apps organized under solid folder icons: travel, reference, music, graphics, arcade games, adventure games, whatever. 3. Drop skeumorphism: We don't need leather-bound MacBooks and iPads and we certainly don't need apps to be cluttered with unnecessary leather crap. Or anything that mimics anything else that doesn't add any function. This is easy to fix: ask Jonny Ive for advice. He works right there. Just follow the same principles that he follows. iOS 6 needs to be as elegant as the hardware it runs on. It should be a extension of it, the whole thing should be one single coherent work in which hardware and software follow the same principles. Windows Phone 7 is an excellent example of getting rid of the artifice and the clutter, just providing with information. From the icons on screen to the apps themselves, it all should be about the user information presented in the clearest, most elegant way possible. Seriously. Fix the 1 in the calendar icon. And the calendar itself needs an overhaul, too. Not that we care much for the beta version of Siri. We still think it's a gimmick with little value at this point. But it's only logical to think that Siri would be fixed to be more useful in iOS 6. The rumors say there will be a 2.0 version. I would be happy with a version that works ok, all the time, and it's not awkward to use. I don't think the latter is going to happen until we have Star Trek-like artificial intelligence, though. I don't want the Stocks app. I don't care about the YouTube app. And I certainly don't want the Newsstand, which I can't even make disappear into a folder unless I use a trick. I want to be able to remove your default apps. Ask me if I'm sure—twice, if you want—but just let me do it. Thank you. What are you expecting? What's your number one request for iOS 6? Tell us in the comments.